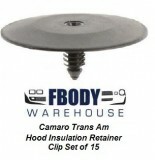 Your 1978 1979 1980 1981 Camaro may or may not have come with a hood insulation blanket. Either way it is a good idea to install and ALL models are equipped with the mounting holes for the clips so adding a hood blanket is not a problem. 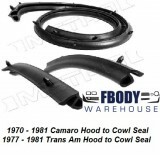 We offer molded and non molded versions for all models including the Z28 1980 – 1981 with air induction. Adding a blanket prevents heat from the top side of your hood which causes paint damage and premature decal wear. Also the blanket is used as a fire protection designed to drop and smother an engine fire. It will in addition to the previously mention qualities quiet down the engine bay some making for a nicer sounding car inside and out.